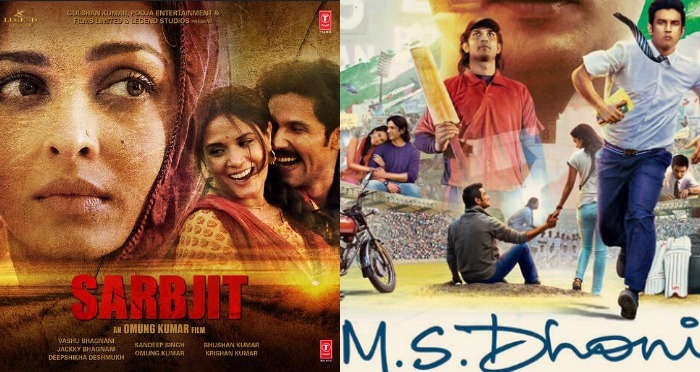 Well, it’s time for India’s entry to Oscars and two Bollywood movies have made it to the list; Aishwarya Rai Bachchan and RandeepHooda’s ‘Sarbjit’, and Sushant Singh Rajput’s super hit biopic ‘M.S.Dhoni: The Untold Story’. While the former was a critical success and an average grosser, the latter received mixed reviews from critics and turned out to be a massive commercial success. ‘Sarbjit’, starring Richa Chaddha, Aishwarya Rai Bachchan, and Randeep Hooda, was based on the true story of Sarbjit, an Indian man who was sentenced to death by the Government of Pakistan for alleged being a spy, which was later on proved to be untrue, but not before Sarbjit had spent 22 years of his life in prison. From the perspective of Sarbjit’s sister Dalbir Kaur, portrayed by Aishwarya Rai Bachchan, this was one moving account of a family which was reduced to a mass of tears due to faulty policies and egoistic relations between two nations. On the other hand, ‘M.S.Dhoni: The Untold Story’ was based on the life of Indian skipper Mahendra Singh Dhoni, who rose to fame after much struggle. His personal life and his rise in the field of Cricket, was portrayed beautifully by Sushant Singh Rajput, and the story crafted amazingly well by Neeraj Pandey. Though the movie got mixed reactions from critics for being too high on emotions, it tugged at everyone’s hearts, mostly because cricket is a revered game in the country. Next : 2016 Year Ender Special: Top 10 Viral Bollywood Photos That Broke The Internet!